Ever looked at a heap of steaming spaghetti and suddenly wished it were packed into slabs of cheesy, deep-dish pie? Well, that's weird. But, apparently, your wish is coming true as the latest way to shovel massive servings of Italian comfort food into your face at Olive Garden, and it's aptly called Deep Dish Spaghetti Pie. 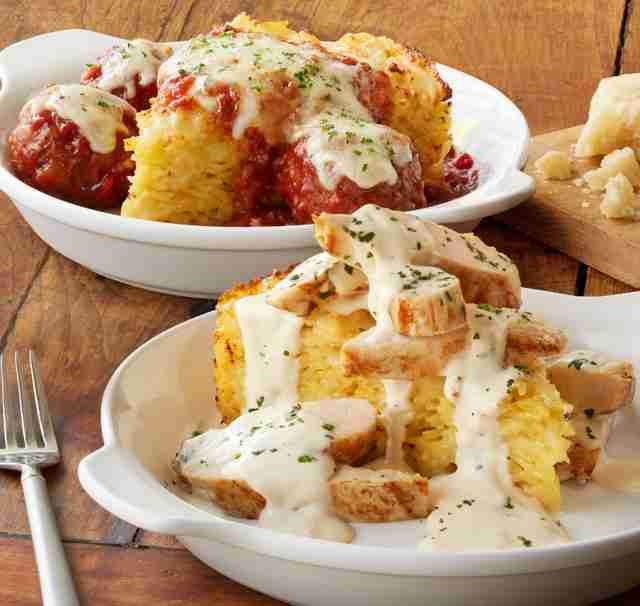 Olive Garden said the new spaghetti pie, which comes in two different flavors, will launch as part of its new summer menu "beginning this week," along with new varieties of its lunchtime breadstick sandwiches, according to a press release. The pies are made with densely packed spaghetti noodles, a ton of cheese, and Italian bacon that's crammed and baked into pie crust, then topped with meats and sauces. They're basically giant hunks of pasta and cheese and they sound fantastic -- especially if you believe that twirling and slurping spaghetti noodles prohibits you from eating it fast enough. 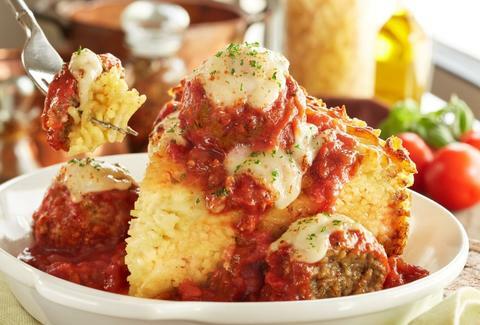 Meatball Deep Dish Spaghetti Pie: Spaghetti, seven cheeses and Italian bacon baked to perfection in a flaky crust and topped with meatballs and homemade meat sauce. Chicken Alfredo Deep Dish Spaghetti Pie: Spaghetti, seven cheeses and Italian bacon baked to perfection in a flaky crust and topped with grilled chicken and our homemade Alfredo. While spaghetti pies might seem like an insane faux-Italian food creation designed for Americans, Olive Garden claims it's actually inspired by a traditional Italian dish. In fact, the chain's Executive Chef, Jim Nuetzi, told BuzzFeed News that it's typically made with "the components of two or three leftover meals mixed together, tossed with spaghetti, and baked in a flaky pie crust.” (You can find recipes for similar dishes online, too!) Then again, lasagna is sort of like a savory layered cake if you think about it, right? Tony Merevick is Cities News Editor at Thrillist and can't believe he's never eaten spaghetti pie. Yet. Send news tips to news@thrillist.com and follow him on Twitter @tonymerevick.